Lorenzo Esposito Fornasari is a singer with an impressive range and enough drama in his highly expressive voice to fill the Old Vic several times over. 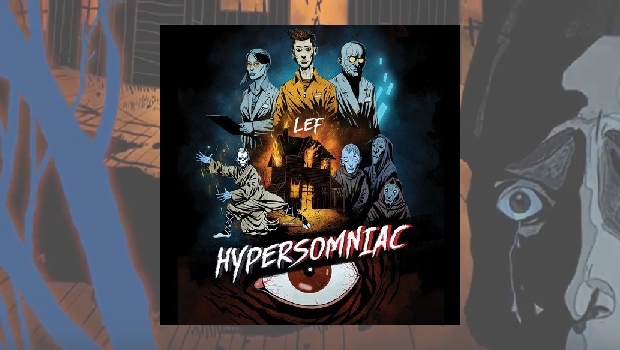 Having appeared with various bands on numerous releases on the RareNoise label, LEF now strikes out on his own with Hypersomniac, an ambitious multi-media concept digging the bones of our old friend, the future dystopian society. Inspired by albums from his youth such as Tommy and The Wall, LEF’s project explores the “dichotomy between the material and immaterial” and a “dystopian future” arising from “the paranoid chaos of the current era”. He does this through a piece of music some 52 minutes long, the individual tracks running into each other seamlessly. The story, co-written with Pier Luigi Rocca is further illustrated via an online comic by graphic artist Nanà Oktopus Dalla Porta, links at the end of this review. LEF has appeared on albums by O.R.k., Obake, Beserk, and others and his connections enabled him to assemble a stellar cast of supporting musicians which greatly assists the music towards having a life of its own. And so, amongst other things we are treated to dissonant sax squalls and uneasy listening powered along by former Motorpsycho Kenneth Kapstad and his instantly recognisable shamanic rhythms. One of the most powerful examples of Ken’s rhythmic muscles being flexed comes early, with Parallel Powers, a massively lumbering beast of a rock song with some great Hammond magic from Ståle Storløkken. Later in the album the self-generated vocal harmonies of A Glimpse Of Emma allied to its space age backing gives it the feel of a modern R’n’B track beamed down from a superior alien race. Another highlight, in an album that never really lets up, is the epic Therapy that develops the space rock heft of Motorpsycho at their most insistent, with some fine sax blowing from Rebecca Sneddon providing the cherry on top. The album closes with Let The Sun Fall Apart, another highly tensile and wrought epic, wearing some Floydian touches on its otherwise far darker sleeves. Hypersomniac is an expression of musical ambition that should satisfy fans of progressive music making, but maybe a tad too much for the more conservative fan. It’s their loss. With the inevitable influence of Lorenzo’s more left-field bands woven into the conceptual rock vibe, this was never going to be an easy listen, and that is a good thing, and as it should be. Hypersomniac shows that you can actually forge fresh ideas both musically and lyrically from the tried and tested rock concept favourite, good old fear and loathing. This music is suitably expansive and cinematic and shows no little skill in arranging and composing, and with the online comic makes for a concept on the grand scale.